Because you get to put vegetables in CAKE. Green stuff, right into dessert. It’s like eating your vitamins and stuff. Plus it makes the cake super moist and soft. No. Don’t even give me crap for that word unless you have a better alternative. Since I’m pretty sure you don’t want a damp, soggy or clammy cake. I’m all about baked goods with zucchini because, hello – it puts healthy stuff right into your dessert. I also kinda like the texture since, well, if you haven’t learned by now I am a complete texture freak. I have to say that my favorite zucchini treat is that old fashioned bread, but this is only trailing behind by a hair. Sorry. Hair and baked goods. Not a good mix. Here’s the other thing. I am pistachio CRAZED. Back in the day, I used to think that pistachio-flavored things were for old people. Which, you know, I can say now since I am an old person and love pistachio everything. But really, pistachio flavor ranked up there for me about as high as butter pecan. It sounds okay but… eh, I’ll try it when I’m 65. Then I downed a few pints of pistachio gelato (the talenti version… !) and wanted pistachio everything in my face for the rest of my life. Too much pistachio was still not enough pistachio. I made pistachio pesto and talked all about this before but I’m not positive that I conveyed my severe pistachio dependency. Especially since I am that person who hates nuts in their desserts. Nuts belong in a bowl on your coffee table. Not in your cookies. Luckily, I am a gigantic hypocrite. I made the pesto (A+), made some chocolate pistachio cookies (big fat F), made an insaaaane pistachio cream cake for the cookbook (A++++ times infinity) and now have made this cake with candied pistachios. I’m certain that candied pistachios are going to be my new thing. As far as things are concerned. I get that many of us are quite different, but a cake made with whole wheat flour and a vegetable is a legitimate snack in my world. I’m totally serious too. I’m obviously not talking about three slices of this cake, but I find that a square of this in the afternoon is perfectly acceptable. I threw the whole thing together based on my banana bread snack cake, which is one of my all time favorite snacks. So yeah. Maybe not an every day snack. Maybe not even an every week snack. But still a snack? Yes. Or in most normal people’s life: dessert. Hey, at least I’m not trying to sell you on it for breakfast. Preheat the oven to 350 degrees F. Spray an 8×8-inch baking dish with nonstick spray. In a small bowl, whisk together the flour, cocoa powder, baking powder and salt. Set it aside. In a large bowl, whisk together the melted butter and the sugar. Once smooth, whisk in the egg, sour cream/yogurt, milk and vanilla extract. Stir the mixture until it is a smooth batter. Gradually add in the dry ingredients and stir until just combined. Stir in the zucchini and chocolate chips. Spread the batter into the greased pan. Bake for 30 to 35 minutes, then remove from the oven and let cool in the pan for 20 minutes. Spread the pistachios out on a baking sheet layered with parchment paper. Mix together the hot water and brown sugar until the sugar is dissolved, then toss the pistachios with the sugar liquid. Roast the nut at 350 degrees F for 8 to 10 minutes. Remove the pan and let the pistachios cool completely before breaking them apart and chopping them. Melt the chocolate chips in a doubler boiler or in the microwave. Once they are melted, stir in the coconut oil until it’s melted. Remove the cake from the pan once it has cooled slightly and pour the chocolate overtop. Cover the chocolate with the chopped pistachios. Slice and serve! P.S. if sweet zucchini stuff isn’t you thing…. you should probably definitely make this fried zucchini grilled cheese. Like now. I’m gonna pretend this was my birthday cake. All of it. All for me. No one else. 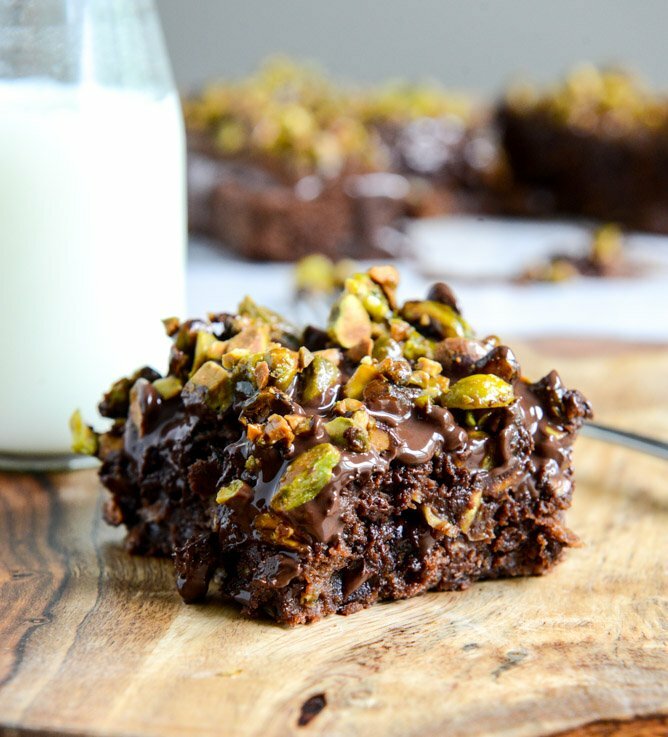 OMG, the crunch from those pistachios with that fudge sauce would be so incredible! THIS….my version of getting not one but TWO greens “in” for the day….pistachios…zucchini…. Dumb as question but what’s whole wheat flour? Am I an idiot or is it a US thing? Gluten content and proteins are what set wheat flour from cake flour and AP flour. Not sure it is strictly a US thing, we have it in Canada and in Mexico. Side note, this recipe was fun and yummy! The pistachios MAKE this recipe pop. I am all about sneaking veggies into anything and everything, but if I wanted to omit the zucchini in this recipe one time, would it impact the texture?